What seemingly starts out as an over-the-top and nonsensical comedy quickly becomes one of the most heartwarming series I've ever seen. Every single character is completely essential to everything that is happening within the world. The plot is a bit on the heavy/esoteric side but won't leave you wanting. The animation quality is top-notch, and the vibrant colors are a welcome sight for sure. You will be doing yourself a great disservice if you skip out on this series. I cannot recommend this enough. Great anime! people who are confused needs to pay more attention! I'm not quite sure where people are getting confused. If you didn't understand anything watch it again. anyways something like that, so what don't people get? This is an AWESOME ANIME with promising action! the visuals seems to be a lot of work! Who says insanity can't make sense? Attention: do not be alarmed or disheartened if things don't make sense right away. One of the main mechanics of the story is how it jumps around in the timeline of the people involved. This series is a very unique and interesting thrill ride on the most insane roller coaster in the world. Though the art may seem simple at times, the story is very solid underneath. A wonderful story about the love of a God father, a Buddha mother and their assorted children will unfold like an origami before you with numerous twists and sudden shifts, then finally come back together into a marvelous new form. It is well worth the effort to watch it completely through to the conclusion. The most underrated anime of this season!! Kyousougiga is an amazing anime so far, It has unique visuals with bright colors to keep you amused. The OST is easy on the ears and can immerse you into the show, with a great opening. The characters are likable and have their own back story that makes you understand where their coming from, also the character interactions are always fun to watch. It can be a feel good anime but could flip that over it's head and become a feels fest. 5/5 SO FAR, a must watch and should be recognized by the anime community. GREAT!! Kyousougiga has a 'lot' going on for it, from the split and reversed narrative it's telling the story in format wise, the symbolism in the brief flashes of imagery across the screen and the second meanings of the things characters speak, the occasional alliterations to Alice in Wonderland (Though they're less blatant than expected), the old school feel in terms of themes, animation and character behaviors (With many of them having very human complexities considering many of the non-human characters composing the cast) and so much more, Kyousougiga is going to be a love it or hate it kind of show. You'll either find it too pretentious or get swept up in its mysteriousness, you'll find the animation uneven or feel like it evokes a raw simplicity in favor of the more fantastical moments of flash and you'll either think its characters are incredibly one note or pick up on the more subtle complications going on between each one of them. Kyousougiga has many similarities to a work from a similar director of a similar background, Kunihiko Ikuhara, a man who's background mostly focused on the worldwide known Sailor Moon who would later go on to produce two hugely polarizing anime productions, Revolutionary Girl Utena and Mawaru Penguindrum. 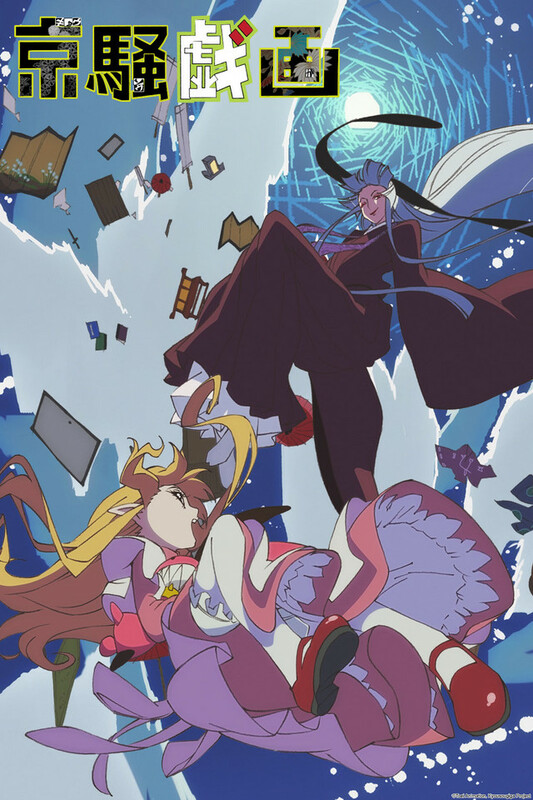 With Kyousougiga, the Director is Rie Matsumoto, who has spent the past couple years working on the Pretty Cure series in its many successor/spin off productions. Combine these similar backgrounds with an extremely obscure ONA of Kyousougiga back in 2011 and a follow up a year later and the anticipation for a full series was highly awaited without a doubt by those who had tasted the rather bizarre creation of this Magical Girl production alumni. While there's not a GREAT deal of social/ethical commentary going on in Kyousougiga, what it IS doing a fantastic job of is giving an artistic interpretation of the consequences of our actions. While the initial episode 0 seems to be nothing but a visual overload and abstract dialogue, a few episodes in starts to paint a MUCH clearer picture of the shows true intentions, a commentary on the interpersonal conflicts people can go through and does a fantastic job showing how strengths and flaws can create a great deal of physical and mental individuality. Particularly in the three siblings, we see with their respective episodes how their distinctly different wants, needs, weaknesses and gifts make them seem so realistic and human for fictional characters. What I am TRYING to say, in case that is a little confusing (And I don't blame you, reading it back it can be a bit hard to make sense of it) is that the character depth in this show is fantastic. I'm rambling at this point, if you want a show that WILL toy with your expectations of it, you 'need' to watch Kyousougiga. Easily the sleeper hit of 2013 that will surely leave a lasting impression on its viewers after all is said and done. Anime in Wonderland but not quite! The first three episodes (0,1,2) offer action, romance, a complex possibly recursive plot, and a sprawling wonderland almost anyone can enjoy: "Mirrior Kyoto". There are spirits, familiars, artifacts, gods and mortals, and it all blends together seamlessly in their sense of place in the universe. This show asks a lot from its viewers, but the spaces and characters it covers more than makes up for it being a demanding watch. If you love Mushishi, or complex fairy-tails this is an immediate watch. This anime deserves greater popularity than it currently has. People that did watch it appreciate it, but sadly not that many people put the effort into watching the series (at least compared to more mainstream anime). My goal with this review is to change that and convince more people that this anime is worth watching through to the end. In a way it's kind of like Steins;Gate where at first you're like "what the heck is going on?" but eventually everything comes together and you see the beauty of it all. Watch this anime and you will see the beauty of it all. A lot of anime out there is/are irritatingly formulaic and cliche. Don't get me wrong - anime like that can still be entertaining, but it is nice to also have a truly unique and original work every now and then. Think of cliche anime as McDonalds and anime like Kyousougiga as a wholesome meal at a sit-down restaurant; they are both good but good in different ways. Kyousougiga makes you think and wonder and if you are one who likes to use your noodle you will enjoy this show. To further illustrate this point I'll put it this way: I usually dislike recap episodes but the recap episode at the end of Kyousougiga was actually worthwhile. You will experience intrigue and a variety of complex emotions as you watch this series. Another thing that makes this anime great is how it references real historical monuments and figures from Japan. If you watch the series this will become clear in episode 5.5. It's cool to know that the inspiration for things in the anime came from real world objects and people. And last but most definitely not least is the OST. The OST is beautifully composed and works in harmony with the animation and plot. A lot of people may not appreciate the value of high quality, brilliantly composed music in anime, but it does indeed make a difference. A big one at that. I wish the makers of this anime success, both financial and critical (the latter of which may have already been achieved). They deserve it. Calling this show a visual success is like calling bread moderately popular. Every third scene could be paused and turned into a magnificent work of art. If you miss the insane artistic brilliance of such masterpieces as Tekkonkinkreet and the Beatles' Yellow Submarine, look no further, for, like an insistent Admiral Perry, your Black Ship has at last rolled in. The first episode (by which I mean #0) is quite insane, so those who dislike surrealism should definitely steer clear. However, the show wins on pure art. With the second episode (#1) things start to become much more clear... I'm not even sure if #0 was really part of the continuity or just a bunch of randomesque nonsense a la Suzumiya Haruhi's first homemade-video episode. Still, anyone with an artist's soul will adore this. If you've begun thinking that all of this season's anime are the same (sportsfest, boobfest or genericfantasyfest, take your pick - all combos also available) then this show will shake you up and then some. Worth a try, at least, but be prepared for a wild ride down the rabbit hole. This somewhat-confusing story is driven primarily by its [wonderful] characters and the family bonds that they share. I know that sounds boring but there's tons of zany, off the wall stuff happening on the side. Story: What we have is a beautiful story about a bunch of derelict children trying to reunite their family. I won't say anything else because I think it would be better to watch without any preconceived notions. Animation: Good quality with lots of colors. It's nothing revolutionary, but it's a beautiful fit for the story. Sound: The opening, ending, and OST are all fantastic. Conveys a ton of emotion and sets the tone perfectly. I honestly can't wait until they release the OST so I can listen to it on its own. Characters: Almost every character is extremely lively or interesting in some way. The most boring character is probably the original head priest and he's still somewhat fascinating. You would be hard pressed not find someone who resonates with you. TLDR: Great story, good animation, fantastic soundtrack, lively and interesting characters. Koto and the city in the Mirror. . .
One day, Koto finds herself in a place called the "Mirror City"; it is a place that people may not normally enter nor leave. This city is run by a counsel of three, who were left in charge of the city under the premise that their parents would someday return. Koto intrigues the counsel of three as she bears resemblance in both flesh and name to their parents. As Koto attempts to find a way to return herself home she also begins to become curious about her origins and looks for clues of her family as she tries to escape Mirror City. Koto - A young 14 year old girl. Carries a hammer weapon that can change in size. Myoe (Yakushimaru) - A Buddhist Monk that takes care of Koto and her familiars. Yase - An oni (demon) girl. She appears to be very elegant and polite most of the time. Kurama - An elderly man who sits in a giant sake cup. He is the main head of the city. Kyousougiga has very quirky characters (which is not a bad thing at all). It was very entertaining to see Koto antagonize Myoe, or to see Yase explode in anger. For those of you who hate to see cookie-cutter character archetypes, I think you would really enjoy this show. The only problem I have with this series is that some characters have the same name, which was especially annoying if it wasn't obvious who was being referred to just by the context alone. Overall the characters were really great and entertaining to watch. The story might seem really convoluted to some people, which I supposed is a minor downside to this anime. But I on the other hand really loved how they executed their story telling. Kyousougiga seems to really be invested in its characters; the show gives each character their own episode to allow the viewer identify the motives behind their actions. Even though these episodes aren't exactly necessary, they didn't feel like filler content either. The great thing about this anime is that it doesn't exactly lay out every single detail for you; rather, it gives just enough information to allow you to draw your own conclusions about certain things. And this is what makes these character specific episodes so great. The main story held my attention well, but at the same time it never had me "dying" to see the next episode. Even though this show never really had you at the edge of your seat, it did generate quite a bit of thought. You can really tell that a lot of effort was put into the writing of this series. Kyousougiga had a very excellent soundtrack. I liked the OP and ED enough to watch them each time I sat down to view an episode, but one track that especially stood out for me was a piece called "City of Eternity". This track was very mellow and calm, it complemented the atmosphere of the anime beautifully. Needless to say I was impressed. . .
Kyousougiga was animated by Toei Animation studios. The artwork was very bright and colorful, which is a nice change in pace from what I'm used to. Another notable thing to mention is that the overall quality in the animation never seemed to drop at any point in the anime (This is obviously a very good thing). So unless you have any qualms about the particular art style, then you should find Kyousougiga to be very aesthetically pleasing. The most important aspect of any anime is it's lasting impression. Kyousougiga is by no means your "average" anime. It has a very different feel to it which helped set it aside from other shows I've seen in the past. I really enjoyed the show and I definitely recommend it to anybody looking for something a tad bit different. [+] Beautiful to look at and listen to. [+] Story generates a lot of thought from the viewer. [-] Similar names can lead to confusion if the viewer isn't paying close attention. [-] Some parts of the story feel needlessly convoluted sometimes. Something fresh and new; albeit Kyousougiga is not the perfect anime, it still has many great features. I don't feel disappointed watching it at all!